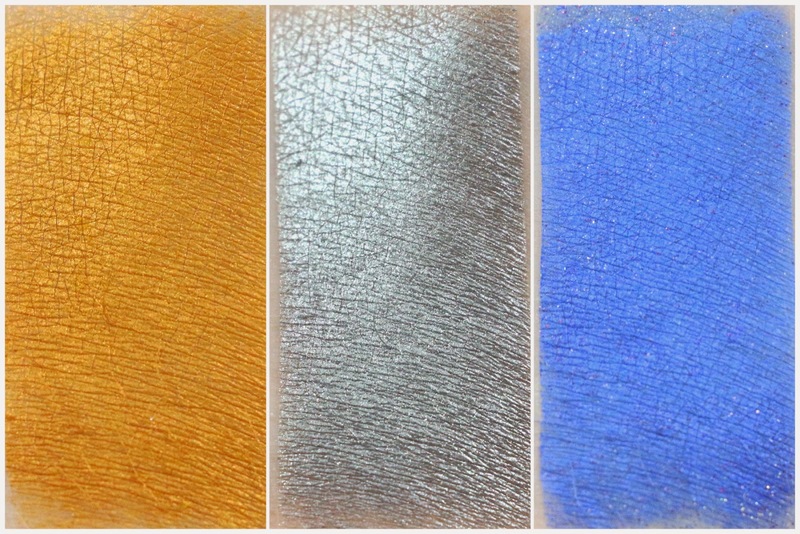 My March Innocent+Twisted Alchemy subscription arrived a while ago, but I just got a chance to swatch it all. 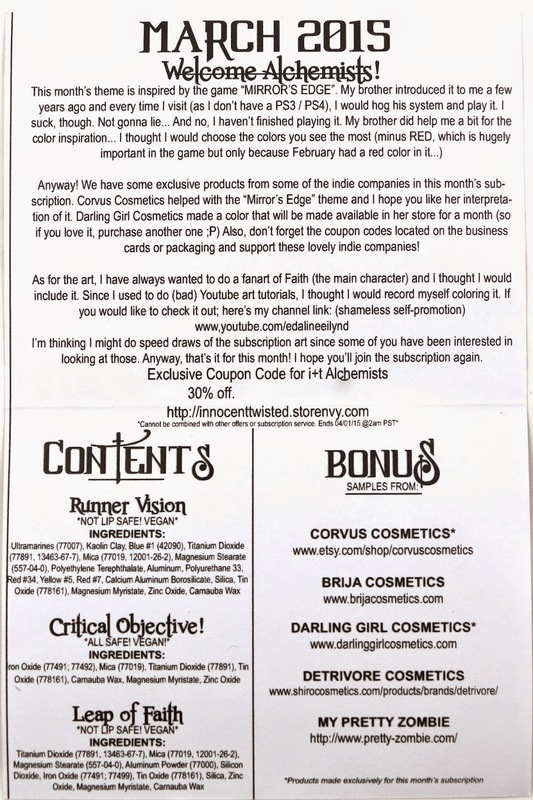 There were a lot of bonus extras this month, a few from companies I've been meaning to try! Shipping - My subscription shipped on the 12th of this month, and arrived 2 days later via USPS from within California. Free Samples - There were 5 bonus samples this month from various other indie companies. The info card, which explains that the theme this month was based on the video game Mirror's Edge. This is a very pretty yellow orange amber color, which actually looks more metallic in person. Normally I'm not a fan of orange eyeshadow, but this one is actually very pretty. 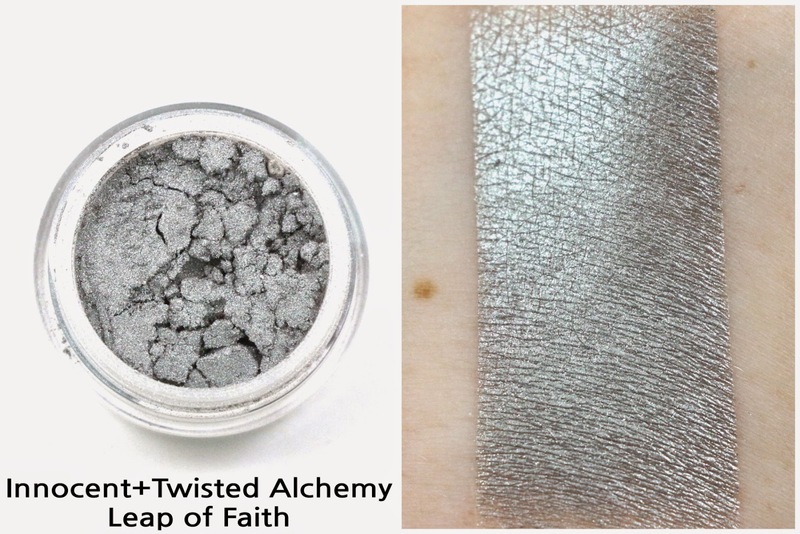 This shade is a silvery metallic shadow. I think it would look good with Runner Vision, maybe as an eyeliner. This is a bright blue matte shade with lots of red and silver glitter. The glitter is hard to see in the photo, but it reminds me of Captain America or something. It would be fun to wear for a fourth of July look. 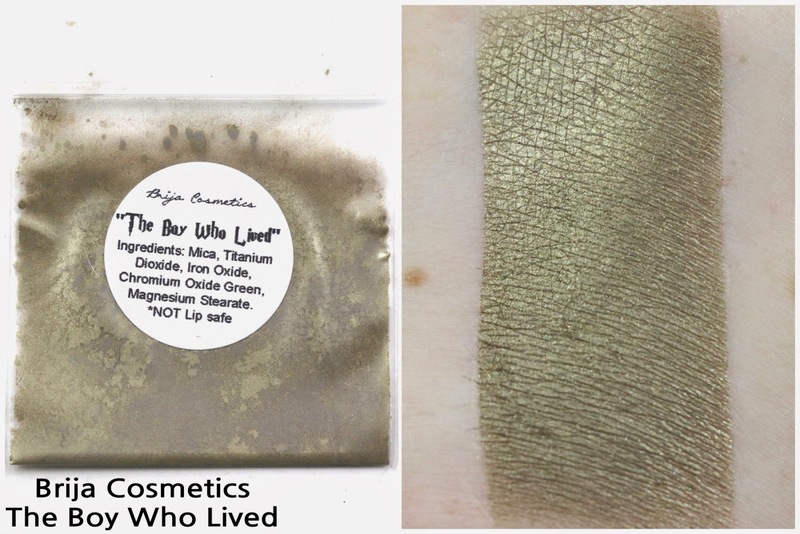 Brija Cosmetics The Boy Who Lived - "It shares it's coloring with the remarkable green of Harry's eyes - he got them from his mother. Look closely and you'll see a flash of gold; perhaps he's finally sought out the golden snitch whizzing by on the Quidditch pitch." 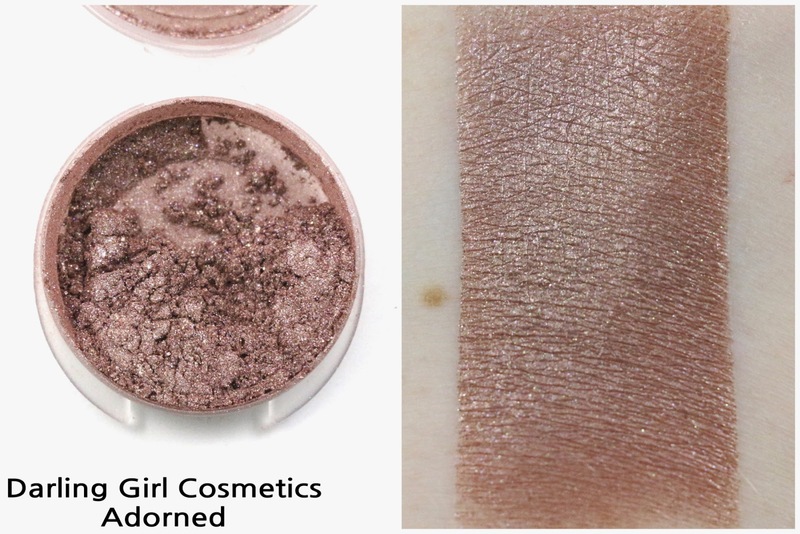 This shade is from Brija Cosmetics' Harry Potter inspired collection, which I've actually been wanting to try. This is a great taupey green gold shade which was very smooth applying and quite metallic. I would love to foil this or use it over Pixie Epoxy for a quick one shadow look. 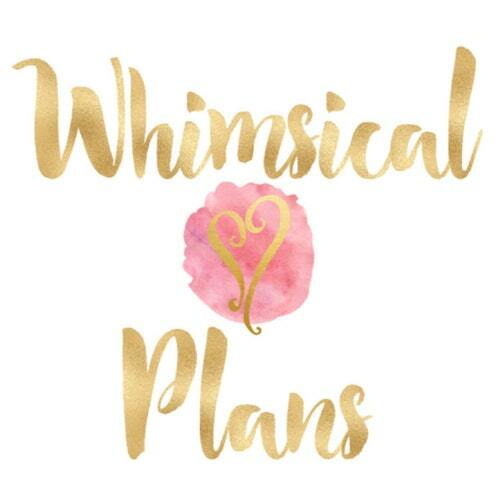 This is another company I've been wanting to try, and I actually just received a couple collections from, so look for those reviews coming soon. 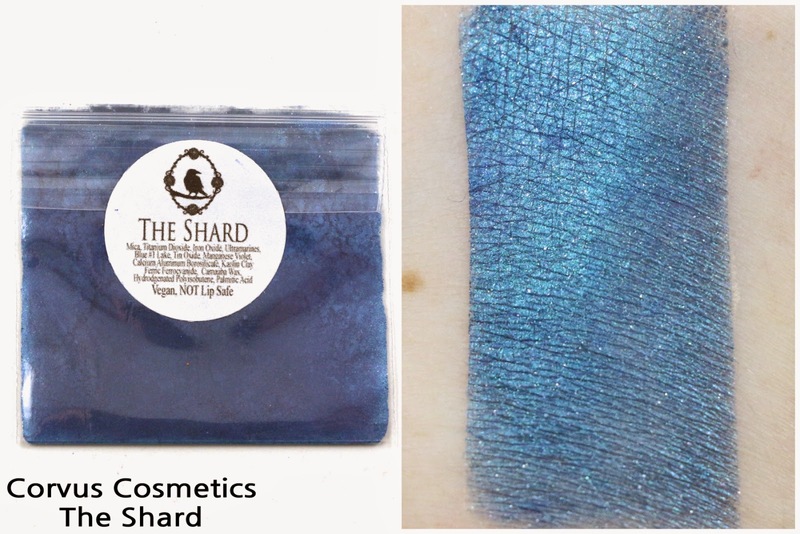 This shade was created exclusively for the subscription, and it's really pretty. 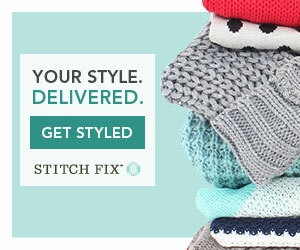 It's like a dark navy blue with a turquoise shift, and tons of silver sparkles. This shade is a medium brown with gold sparkles. This will be great for a one shadow look, but I hate the clamshell packaging. 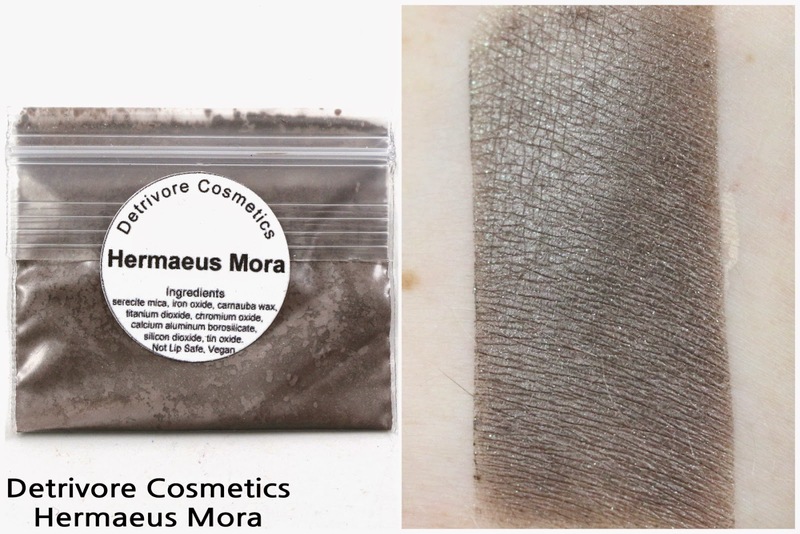 Detrivore Cosmetics Hermaeus Mora - "Dark, balanced taupe with green glitter." 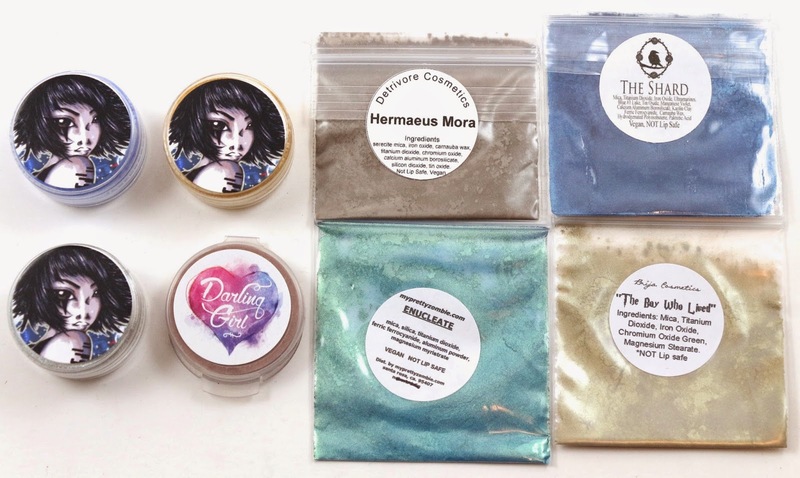 It's funny, I have quite a few free samples from Detrivore Cosmetics, but I don't think I've tried any of them yet. This one is from the Detrivore Daedric Princes collection. Detrivore is mostly known for their matte shades, but this one has a bit of a sheen. My Pretty Zombie Enucleate - "Ocean teal blue." 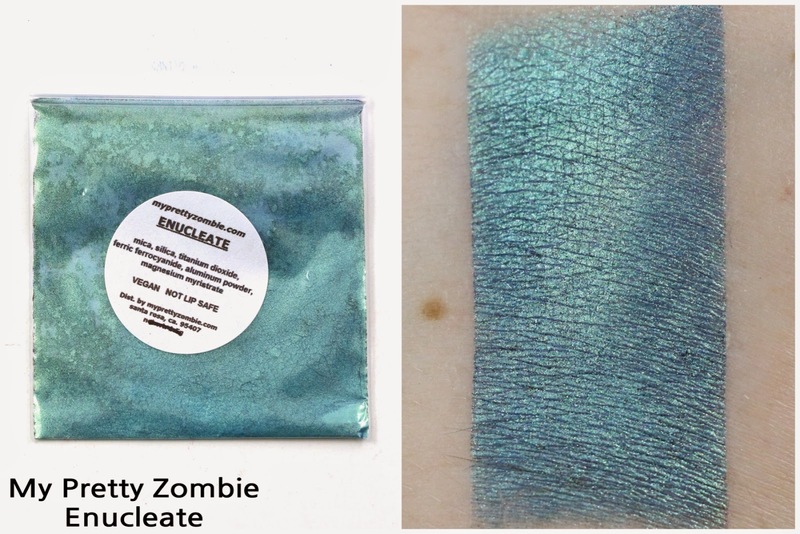 I believe everyone received a random sample from My Pretty Zombie, but I already had this shade. 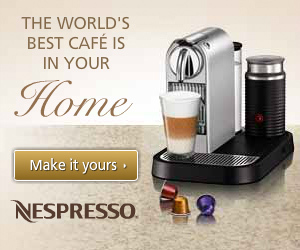 It's from the Injurious Collection, which was released on Thanksgiving last year. It's quite beautiful, but I'll probably use this extra sample as a gift. 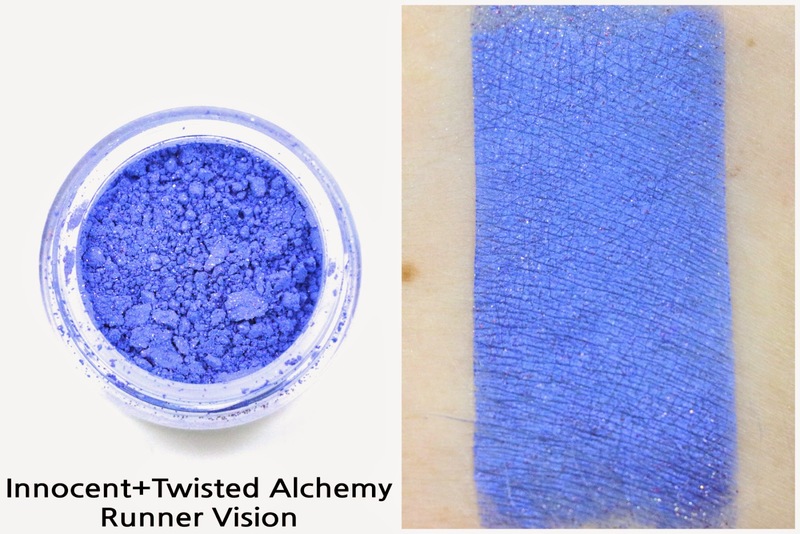 Overall, I liked the main shadows from the Innocent+Twisted Alchemy subscription this month, but I also really liked the bonus samples. 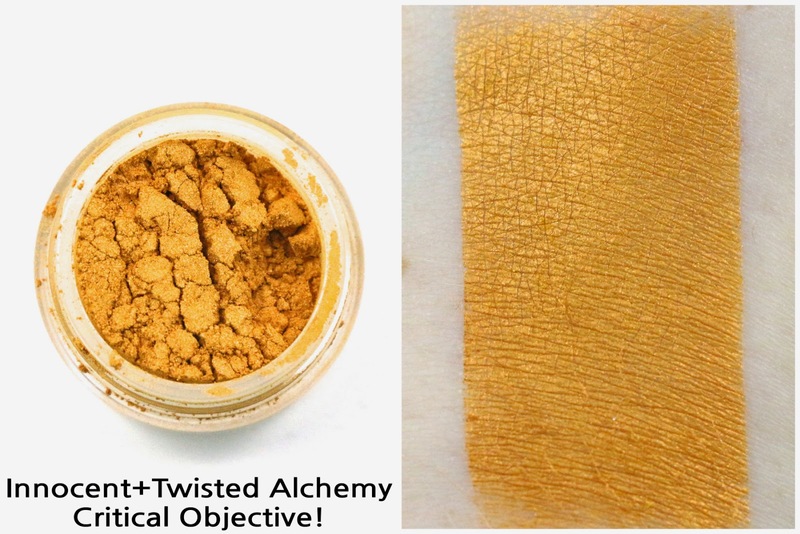 My favorite of the Innocent+Twisted Alchemy shadows was Critical Objective!, which was surprising. It's not typically the sort of color I like. And my favorites from the bonus samples were The Boy Who Lived and The Shard. I can't wait to get more use out of those, although I do wish The Shard was available to purchase. I might have considered buying a jar of that. Overall Satisfaction - My favorite shades this month were Critical Objective!, The Boy Who Lived, and The Shard. 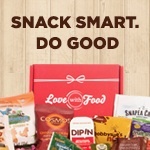 I'm looking forward to next month's subscription!